Burj Al Khalifa was completed in 2010, it stood 828 metres tall. The second placed Taipei 101 was VERY FAR away. However, there was one building which can still claim to be tallest in the world today and perhaps for many more years to come. It is our very own Petronas Twin Towers. Note the word ‘towers’ has an ‘s’ behind it while all the rest in the world are known as ‘tower’. Yeah sure, say what ever you like on ‘syok sendiri’ but if you ask Taipei folks which tallest buildings they love most, guess what’s the answer. Yet, Taipei 101 does not even have enough space around it to build huge parks like our Petronas Twin Towers. Yes, I am serious. Petronas Twin towers are still the tallest TWIN TOWERS in the world. 🙂 Another ‘tallest’ tower, the Warisan Merdeka was rumoured to be 596 metres tall which meant that if built, will be the second tallest tower in the world, surpassing even Taipei 101. What about other ‘tallest’ towers planned? According to bdonline.co.uk, there are a few and they are as follows: Kingdom Tower (Jeddah) at 1,000 metres!, Ping An Finance Centre at 660 metres, Wuhan Greenland Centre at 636 metres and Shanghai Tower at 632 metres. All three in China. 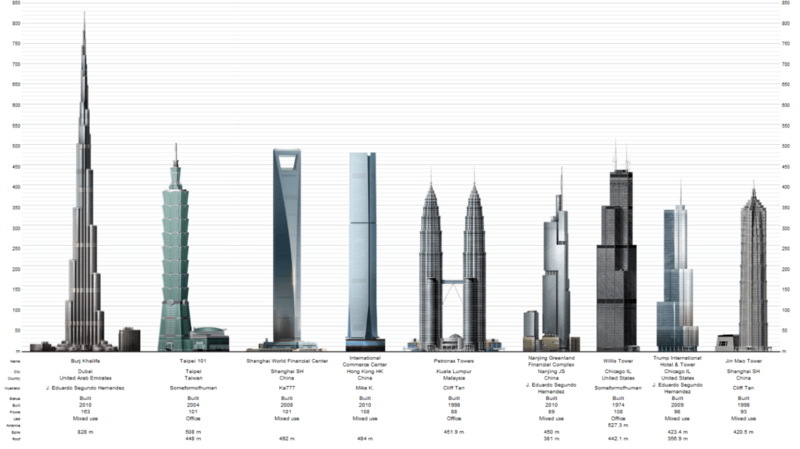 How tall can future buildings be? Let’s wait for Kingdom Tower to complete before we go any further, ok? Next suggested article: Debt Free, really? Let’s buy bungalows, why not? Would 2014 be a tough year?